Every three months, a box of joy arrives at my workplace. That box of joy is also known as the Posse Pack from Bridge Road Brewers. Think of it as a beer club where’ every three months (or even more regularly if you have more disposable income than me), they send you a mixed case of their beers. It’s great for two reasons. Firstly, Bridge Road consistently make some of the best beers in the country. Secondly, the box of joy will include some beers that I’d be unlikely to get my hands on any other way. 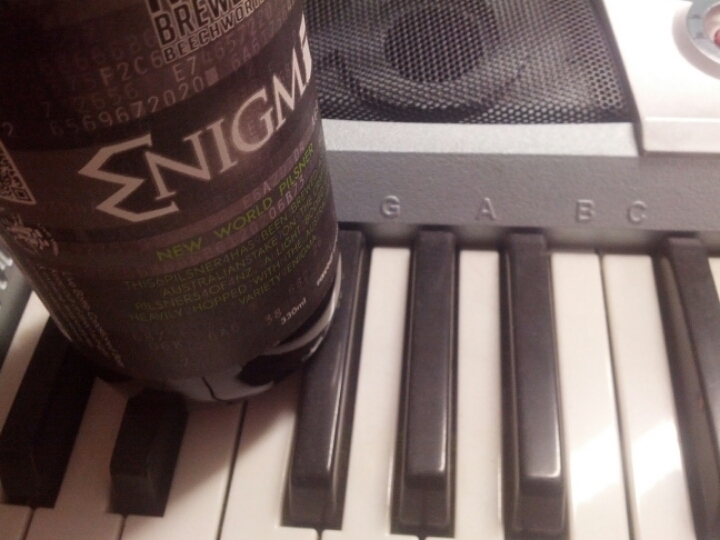 That includes Enigma, a “new world pilsner” that takes its name from the very new hops of the same name. Somehow Ben Kraus from Bridge Road manages to get his hands on new hop varieties more than most other brewers. The hop lives up to its name – it’s unusual, different, hard to pin down. Enigmatic, even. The characters it brings to the beer are unlike any other hops I’ve experienced. After much thinking – and, if I’m being honest, drinking – I’ve worked out that the Enigma hop makes beer taste a bit like white wine. It gives the beer a white wine aroma, which reminds me of chardonnay, and some clean, buttery notes up front in the palate. But there are also some peppery notes mid-palate to spice things up. The clean sharp wine notes work well in a beer that’s meant to be clean and sharp too. And it adds a point of difference to the beer too. I like it for the same reason I like Sorachi Ace – they both give off flavour and aroma that is different to other hops. This is what I love about beer. I really enjoyed this beer too but the flavours I got were different to yours!